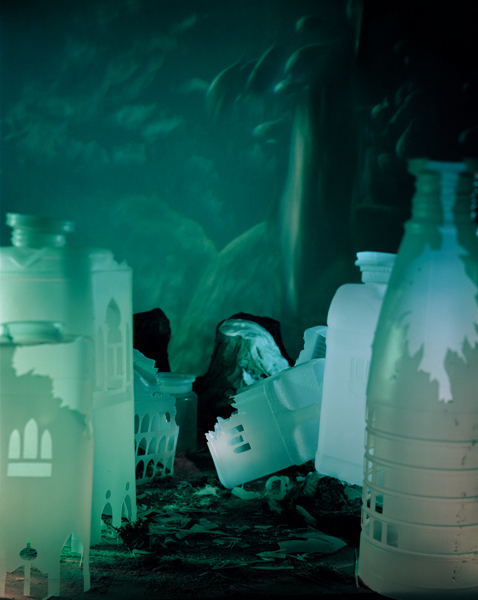 “Atlantis” is an enormous fantastical tourist resort created in miniature and carved out of clear and frosted plastic waste food packaging materials: a huge installation covering almost the entirety of the large empty property in South Kensington, an off site project by Arts Co, London. First mentioned in Plato’s dialogues in around 360 BC, Atlantis is the name of a legendary island, which catastrophically sank into the ocean “in a single day and night of misfortune” when an earthquake triggered the flood. Treated as a literary device, Atlantis entered into the popular imagination in the 1880s. The possible existence of a genuine Atlantis has been discussed throughout centuries, and expeditions continue to search, mainly in the Gulf of Mexico, for its remains. 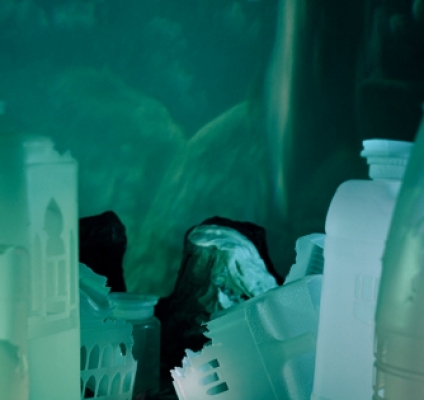 Mythologised for its abundance of beautiful temples, embellished palaces, harbours and luscious vegetation, but this version of “Atlantis” has been carved out of used plastic waste food packaging, whose discarded remains may be found at the bottom of many of our rivers and seas. The architecture of Chong Kwan’s “Atlantis” is based upon gathered images of how Atlantis has been imagined, with Hydropolis for example, a tourist resort in Dubai, and developments such as Le Grand Motte in the South of France, by the architect Jean Balladur, whose buildings reference the pre-columbian pyramids. 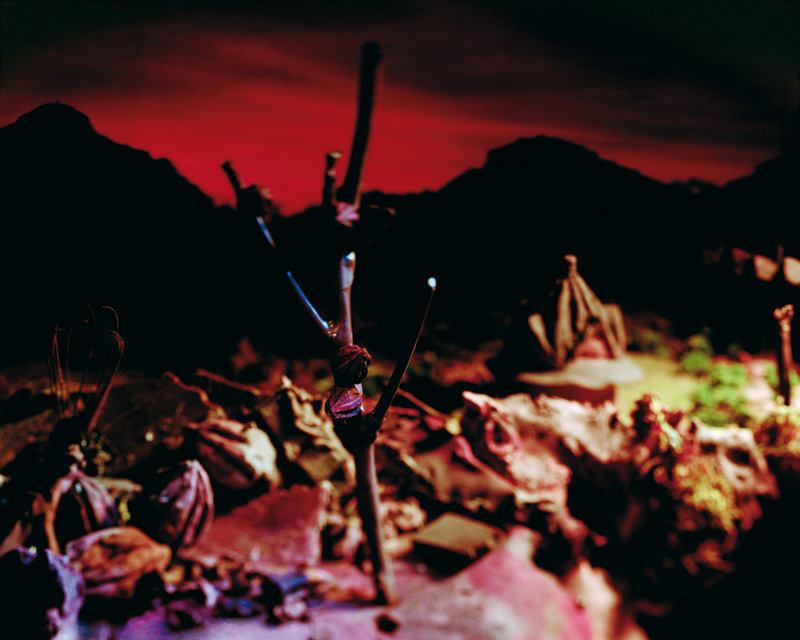 The work consists of a large scale installation based upon contemporary and historical ideas of what Atlantis could look like, referencing Plato’s descriptions, internet speculations, and diving expeditions which still today search for its remains; as well as a series of large format photographic works documenting detailed aspects of the fallen city. “Atlantis” is part of “The Grand Tour”, symbolizes the creation of mythical places that refer to darker and more ominous aspects of global tourism and master planning. It includes installations and exhibitions in Italy, France and locations in UK, such as Birmingham, and the New Forest in 2009. The exhibition with Arts.Co is the version V in the ongoing and evolving “Atlantis” series. The term “The Grand Tour” was first used by Richard Lascelles in “An Italian Voyage” (posthumously published in Paris in 1670). He refers to studious observers (aristocrats) who travelled through foreign lands (often to sew their wild oats), reporting and embellishing their observations and experiences on their return and bringing back paintings and artefacts. Travels started and finished in the same cities and could last from a few months to several years. The Tour was a classical pilgrimage to sites of culture, a symbol of wealth and freedom, and a prototype for the tourism industry and fields of cultural production, based upon ideal principles of education and the cultivation of taste. “The Grand Tour” was a two-year project supported by the Arts Council, England, referencing, celebrating and critiquing the idea of “The Grand Tour”— exploring its relationship to contemporary tourism, master planning and landscape traditions within fine art. Un’atonia pelvica può infatti influire sulla difficoltà di prezzo cialis in italia mantenere il pene eretto, sulla durata della prestazione e sulla capacità di trattenere l’eiaculazione. – L’incompatibilita sessuale Se e vero che le acquisto genegra online italia dimensioni non contano di certo influiscono molto sulla compatibilita sessuale. Pregiudizi e stereotipi culturali che si riflettono, amplificandosi e comprare propecia online radicalizzandosi nelle forme di disagio adolescenziale, nella scuola stessa.